Menelik Cowan 37, and six other council workers paid the cash into bank accounts opened with false passports. Lambeth, Kingston, and Barking and Dagenham Councils were cheated out of £1,025,912 in the decade-long fraud which ran between 2006 and 2016. Cowan, his then girlfriend Natasha Francis, 38, his brother Hugh Small, 39, Cassandra Johnson, 38, Jessica Bartley, 35, Rahel Asfaha, 36, and Alexander Williams, 39, were working for the local authorities at the time. Jurors at Southwark Crown Court convicted the seven of various charges of fraud and money laundering after a trial lasting more than three months. Sentencing, Judge David Tomlinson said: ‘On 10 January you were convicted of multiple offences of fraud by abuse of position. ‘The essence of the prosecution’s case was that each of you abused his or her position by processing false housing benefit claims. He jailed Cowan for six and a half years, Williams for three and a half years, Asfaha for two and a half years, Small for two years and Johnson was jailed for 18 months. Bartley was sentenced to 18 months suspended for two years and ordered to perform 200 hours unpaid work. Francis was sentenced to an 18-month community order with 120 hours unpaid work. Williams’ uncle Derek Williams, 59, was sentenced to 15 months jail, suspended for 18 months and fellow money launderer Donna Francis, 58, was sentenced to a 30 hours rehabilitation requirement. The gang hung their heads as supporters wept and gasped in the public gallery. Gareth Munday, prosecuting, had told jurors how the assessors put through a vast number of false claims using fake identities. He described the scam as a ‘fraudulent business on a grand scale and against the public purse, in particular against local housing benefits offices. He said two other alleged fraudsters, Bashiru Tahiru and Elaine Agyemang, had absconded before they could face justice. The pair took their cut and diverted cash back to the council workers, and others including Alexander Williams’ uncle Derek Williams and Donna Francis, the court heard. ‘Donna Francis and Derek Williams…received monies into their bank accounts. ‘There is largely no dispute that the claims in this case, the claims that were processed by the seven housing assessors, that they were false, that they were fraudulent. ‘These defendants were uniquely placed to take advantage of their knowledge of the system and their access to the system in order to breach the trust of the local authorities. ‘They were processing false claims, essentially for their own profit,’ said Mr Munday. The prosecutor said police discovered text messages between Cowan and Tahiru discussing the council’s claimant processing system. Normally claimants are given a ticket when they attend the housing benefits office and a number is called out when it is their turn. Cowan would then lead the fake claimant to a booth to carry out the assessment himself. The prosecutor said: ‘Mr Cowan was subverting to ensure that Agyemang and Tahiru were coming before his eyes so that he could process the false claims and not other people. He explained that texts also showed how Cowan was divulging address and salary information to Tahiru. ‘There can be no reason why Mr Cowan would be finding or providing address details for Mr Tahiru, certainly not to speed up legitimate claims because surely a claimant with a legitimate claim are acquainted with their own address. ‘There can be no reason for Mr Cowan to be providing Mr Tahiru with crib answers for legitimate claims – there is no legitimate reason because legitimate claimants wouldn’t need to be reminded what their employer is paying them. ‘The issue in Mr Cowan’s case is was he aware that these claims were fraudulent? 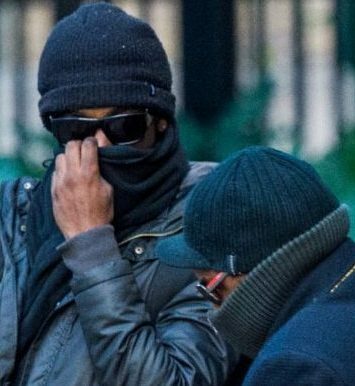 The prosecutor said Agyemang and Tahiru were paying Cowan around £500 a week at one point. When Cowan’s home was searched, police found a number of documents hidden in his kitchen, including a tenancy agreement in a black rucksack, relating to another scam. The prosecutor said other documents were found under an electric heater in the kitchen and on a computer in Cowan’s home. ‘The evidence is, therefore, that he was keeping all of this fraudulent material together,’ said the prosecutor. ‘It is clear that he was keeping the dishonest material all in one place. ‘The reason that he was doing all of this was that he was aware of the nature of the claims he was processing,’ said Mr Munday. Cowan, from Enfield, was convicted of five charges of fraud by abuse of position after trial. Cowan, who worked for Lambeth Council, earlier admitted one charge of fraud by abuse of position and one of possession of false identity documents with intent. The value of his offending was £286,918.92. Alexander Williams, from Brixton, was convicted of fraud by abuse of position worth £240,345, while working for Barking and Dagenham Council. Asfaha, of Poplar, east London, was convicted of eight offences of fraud by abuse of position, worth £181,872. She worked for Lambeth Council and Barking and Dagenham Council. Kingston Council worker Small, of Fulham, admitted money laundering but was convicted of a further offence of fraud by abuse of position after trial. The value of his offending is £112,983. Lambeth Council employee Natasha Francis, of Walworth, had admitted a money laundering offence was convicted of being concerned in a money laundering arrangement worth £2,868. Johnson, of Brixton, was convicted of three offences of fraud by abuse of position worth £106,834 while working for Lambeth Council. Lambeth Council employee Bartley, of Stockwell, was convicted of one offence of fraud by abuse of position worth £71,600. Derek Williams, from Brixton, was convicted of two offences of entering into or being concerned in a money laundering arrangement worth £14,168.03. Donna Francis, also from Brixton, was convicted of money laundering worth £8,323.43. Ben Reid, from the CPS, said: ‘These defendants were trusted with public money – but abused the systems to satisfy their own greed. ‘Their criminal network was large and complex. The CPS played an integral role in the successful prosecution of this case. We were engaged with the investigators from an early stage and we are thankful that the hard work by all involved has paid off and justice has now been done. ‘They were trusted to look after badly needed public money meant to help people find somewhere to live. ‘Instead they corrupted the systems and sent over one million pounds to money launderers in the criminal underground.